BlackBerry Tour to Sport Dual Core Processor? Matt sent me some promotional material from TELUS that seems to have gotten on the web and slipped in a little gem. He sent me an extra page that does not seem to have made it around that shows the BlackBerry Tour having a dual core Qualcomm MSM7600 processor (App – 528MHz, Modem – 256MHz). Personally I am not sure if current BlackBerrys have dual core processors but last time I checked they did not. The last device that I know of that had a dual core was the iDen 7250 which had a processor for the modem and another for the OS. It made the device super fast back in the day and I hope it does the same for the Tour. Could be this is just a fluke but I hope not! So what do you think? 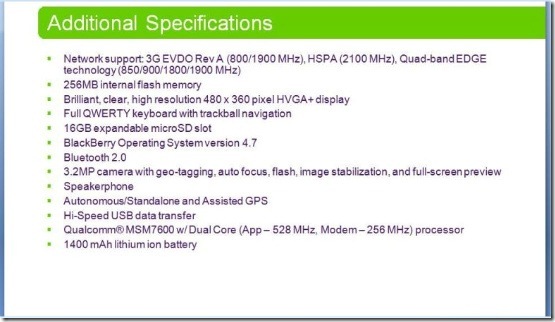 Know anything about the Qualcomm MSM7600? Tagged with blackberry, blackberry tour, sprint, telus, verizon.